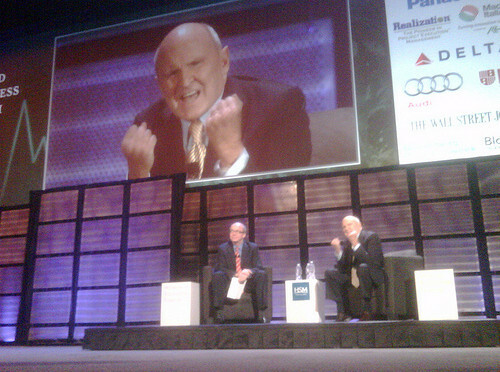 Jack Welch is no dummy. He evokes the 1990’s as powerfully as Friends or Smells Like Teen Spirit, but he has understood what social media is about for a long time. (How many 79-year-olds have 1.4 million Twitter followers?) From a tactical perspective, he’s good at Twitter and LinkedIn, but his real contribution comes from his #1 or #2 rule. Performance: Every GE business had to be either #1 or #2 in its industry, or it needed to be fixed or sold. The market was not kind to also-rans. Efficiency: GE needed to eliminate waste from its processes. Asian competitors would have much lower costs, so GE had to eliminate any excess costs to have a chance of keeping up. Talent: GE needed to have the best talent and talent systems. He made this real via the the 20/70/10 rule, where the top 20% of managers are stars and compensated as such, the 70% in the middle are well-treated but given instructions on how to get to be in the top 20%, and the bottom 10% are “counseled out.” Ruthless, but effective. The competitive situation in manufacturing in the early 1980’s looks a lot like the competitive situation in digital media today. With no barriers to entry and very little cost of production, nobody is entitled to anything. Look at the remarkable lubricating power of Google. When it comes to organic links, if you’re not #1 or #2, your odds of success go way down. The chart below shows click-thru rate by position in Google SERPs (Search Engine Results Pages). It’s a very simple story. The top organic search result gets clicked on over 50% of the time. The third-ranked gets clicked on less than 30% of the time, and anything after eighth-ranked gets clicked less than 10% of the time. The page at moz.com has lots more charts that show how the curve changes for different queries, but its basic shape remains the same. If you are not at the top of the Google results pages for your preferred search, it is unlikely that anyone will click on your link. This is why new people aren’t reading your blog—even if you get Google or Bing’s attention, it’s hard to get to the top of the food chain. How do you fix this? Tactically, do all the things you know you need to do. Run down your social media checklist of all the blocking and tackling that needs to be done. Strategically, refocus. Instead of being about stationery, be about stationery for adoptive parents. Be relentless about being #1 or #2 in your competitive set. Sometimes that means redefining your competitive set. Once you are the #1 or #2 player for stationery for adoptive parents, expand your competitive set—stationery for parents. Only by being relentlessly focused can you earn the right to grow. Welch’s other two rules fit well also—be ruthlessly efficient about your social media. Don’t waste time on things that aren’t working. Test and measure. And be humorless about talent. Don’t give your social media to the youngest and cheapest person you find. Owning social media means owning the brand. It’s a sobering responsibility, and not everyone can handle it. Too many times we assume that the lessons from the past don’t apply in this era. Social Media has upended a lot of received wisdom about Marketing tactics, but it hasn’t invalidated much strategic thinking. Welch’s rigor and focus are a perfect fit with the social media era. Almost perfect competition means that the lazy will be eaten, and people will barely notice. He may be a 79-year-old man and a bit of a loudmouth, (think Gary Vaynerchuk’s even more outspoken uncle from Boston) but ignore him at your peril. He knows what it takes to win in viciously competitive markets. This stuff works.